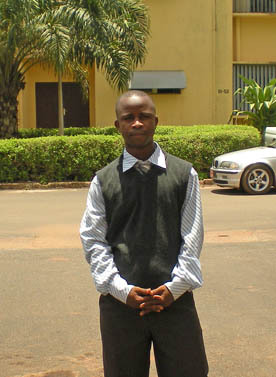 Above: International student Alphonse Tounkara earned an M.B.A. at Point Park University in May 2010. Below: Tounkara back home in Guinea, West Africa. Point Park's School of Business gave international student Alphonse Tounkara the chance to succeed beyond his expectations - and in a global way. The native of Guinea, in West Africa, returned home to continue his career with the Bauxite Co. of Guinea after receiving his M.B.A. from Point Park's School of Business in April 2010. Before his studies at Point Park, Tounkara worked for two years in the Bauxite Co.'s management control department, dealing with budgets. After his return, he moved to new position that puts his M.B.A. to good use -- the operating and investment budget department, handling costs, benefits and risk analysis. Tounkara, 30, is proud of his professional career, but said being honored as an outstanding student by Point Park's School of Business was the "accomplishment of a dream." He highly recommends the School of Business to prospective students. "My experiences coupled with my taste to succeed in the multidimensional environment are ingredients and keys to success at Point Park," he explained. "Overall, I had a wonderful experience." Alcoa, a main shareholder for Bauxite Co. of Guinea, sponsored Tounkara's pursuit of his M.B.A. He lived off campus on the North Side. When he arrived at Point Park, Tounkara started in the English as a Second Language program, then began the M.B.A. course work. As he learned more about the University, he "discovered an ambiance that any newcomer would cherish in school." That ambiance centered on the people he met at Point Park, where the Downtown campus enabled him to interact with the people of Pittsburgh by sharing their culture and vision, he said. It's those relationships he misses most. Archish Maharaja, assistant professor and director of the master of the business administration program, said that as an international student, Tounkara made extra efforts to learn the American education system and always tried to participate in class, asking questions when he needed clarification of concepts and theory. "Mr. Tounkara was definitely motivated by the educational challenges and opportunity to learn about the business sector. From the start of the program, he understood the rigor of the MBA program and academic challenges put forth by the faculty members. He has succeeded in achieving his goal," said Maharaja. "It always makes us proud when students are able to learn and utilize their education in carrying out their duties. An M.B.A. from Point Park has some distinct advantages such as small classes, availability of professors and the rigor of the program," said Maharaja. Rebecca Lee, director of International Student Services and Enrollment at Point Park, described Tounkara as "an extremely engaging student." "Alphonse was always wanting to meet and talk to different international students from all over the world, hear their stories and draw parallels between himself and them â¦ always looking for a common denominator between himself and the other person," Lee said.